I'm sorry to my readers for leaving this blog for three months without typing a single word. My not-so-lame excuse is that I've been preoccupied with finishing the final edit on my first novella (which, incidentally, is set in Beccles). Recently I acquired some 'Waveney Life' and 'The Waveney' magazines from the 1990s and amongst them are some fabulous local stories and poems to tell about Beccles and its rich variety of colourful characters of the past. One such person was comedian Will Judge. 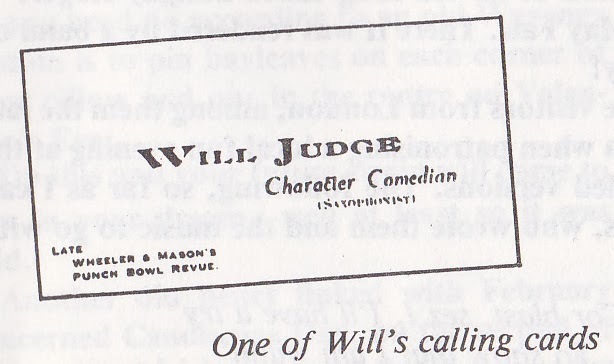 "At fourteen he [Judge] was organising his own repertory company in Beccles. His stage was set up in a stable where the old Cinema building now stands in Saltgate. 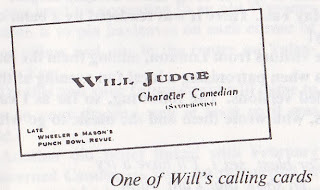 Will charged a penny and local folk flocked in to enjoy his shows..."
After reading this two-page article I was intrigued to know more about him, so in true genealogist style I started researching his past. Immediately I discovered that he was born Joseph James Judge, born 4 November 1883, in Beccles, son of Edgar James Judge and Jessie Elizabeth (nee Lockwood). Joseph, or Will as he later became known, had two younger brothers: Thomas Elmar Judge and Edgar Robert Gibbs Judge (who both became Tailors/Drapers, although Thomas later became a Printers Clerk). Edgar James Judge, born in Bungay, was a Printer & Compositor by trade, quite possibly employed at Clowes Printing Works (and may have worked alongside my 2xg/grandfather who was also a Printer). In 1891 he and his wife and family were residing at Newgate Street but by the 1901 census returns they were residing at 42 Denmark Road, which remained the family home long after Edgar James Judge died in 1923. The 1901 census states that Joseph James Judge was a Carpenter by trade which is interesting when you cross reference his career in the newspapers and find he was treading the boards across London's music halls in 1898/1899 as Will Judge, Comedian (Bob Aldous does state in his 'Waveney Life' article that "the stage was in his blood...and that he had tried to keep the family peace by training as a cabinet-maker".) By 1900 he was advertised in newspaper articles as working the Pavilion's and Palace's in Portsmouth. "...Judge, comedian in humerous numbers and character studies, causing ripples of laughter..."
"...Mr Judge's forte is in character studies, and as a dame and yokel he has few superiors..."
The 1911 census return shows Judge lodging in Leiston and this was quite possibly where he met his future bride, professional singer Gertrude Hannah Orchard, as she was also lodging in Leiston in 1911. Gertrude (or Gertie as she was known in theatre circles) was a Soprano, and in 1911 was in Leiston with her younger sister Florence Orchard. The sisters were travelling from their native hometown of Blackpool to Suffolk in the hopes of finding work as singers. On 3 June 1912 Will Judge and Gertrude Orchard were married in South Shore, Blackpool. Will and Gertie had quite a career as a double-act, spanning the 1910s and 1920s travelling across the UK, back and forth from their home in native Beccles, entertaining in Derby, Kent, Sussex, Plymouth and Portsmouth. During the first world war Will helped entertain the forces. Will was also a keen saxophonist, liked to paint watercolours of Beccles scenes, and make scale models of sailing ships, including a local wherry. On 8 August 1920 a son was born, Edgar Nicholas Judge and he later went on to become a Reverend in Beoley, county Worcestershire. Gertie died in 1947 at 42 Denmark Road, in Beccles. Joseph James Judge died in 1960 "finally called to that great music hall in the sky after a life of giving joy to others" at the home of his son Edgar Nicholas Judge in Worcestershire. Edgar himself died in 1979.